Hi. I'm Rhys from near Goole (originally from York). I'm picking up a nice 2010 XFS tomorrow so really looking forward to that. Welcome to the Forum, Rhys. 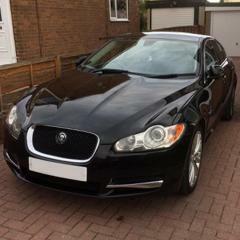 I was in your situation back in October - bought a 2011 XF-S! First car I've owned in 30+ years of company car driving. Still have a silly grin on my face every time I drive it! Getting excited a bit now.. Yay!! Picked it up. Sat on the seller's drive for a while familiarising myself with the controls etc. and adjusting the seat. I took my TomTom and was going to use that, but decided to bite the bullet and try the inbuilt one. Took me a while to get used it tbh. Was a bit confusing when I'm used to the TomTom (Ive the latest one with inbuilt hands free and text message notification/reading). It's had the latest 2018 maps added which helps. Shame it gets dark early as I'd've had a longer play before heading home. Was sat on my drive playing with the controls/settings for about an hour. Got a battery warning so had to start it again.. Hope that's not on it's way out..
Just reading through all the bumf in the handbook at the min, and pleased it's recently had its timing belt changed, as well as a full service. Service book is full so will need another one off fleabay.. I've resisted the temptation to boot it until I'm thoroughly used to it ..but suffice to say I soon got up to speed on the M1 earlier..